Last week saw the launch of a new web site for tigertables.com. 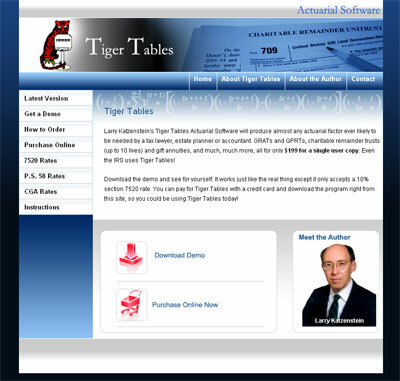 Tiger Tables is in the business of selling actuarial software and offers a demo version for evaluation. Delivering an easy “don’t make me think” approach was our focus during the design phase, and we utilized bold navigation on the home page to attract users to try the demo or buy the product. The overall site design was targeted for a more upscale, professional look compared to the original site. This entry was posted in Before and After, Testimonials, Usability, Web Design Projects. Bookmark the permalink.